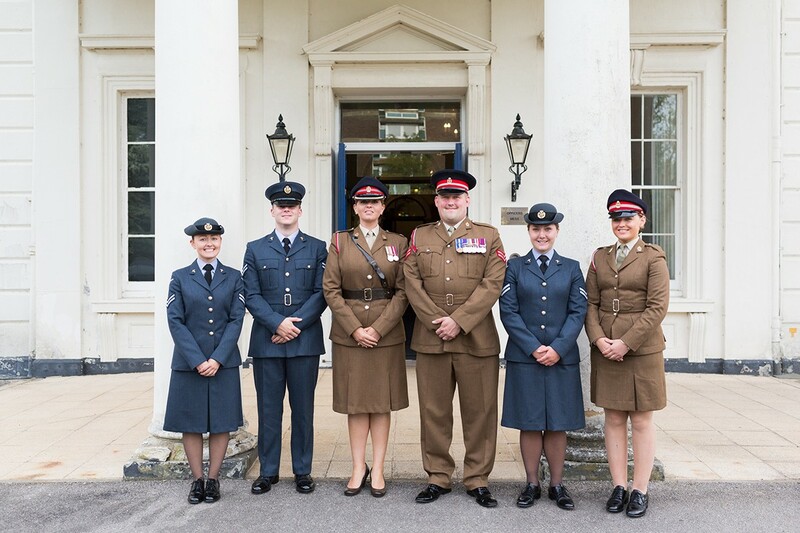 It became clear after the 72nd anniversary commemorations that a huge highlight for the veterans had been the special guest we received at Southwick House. 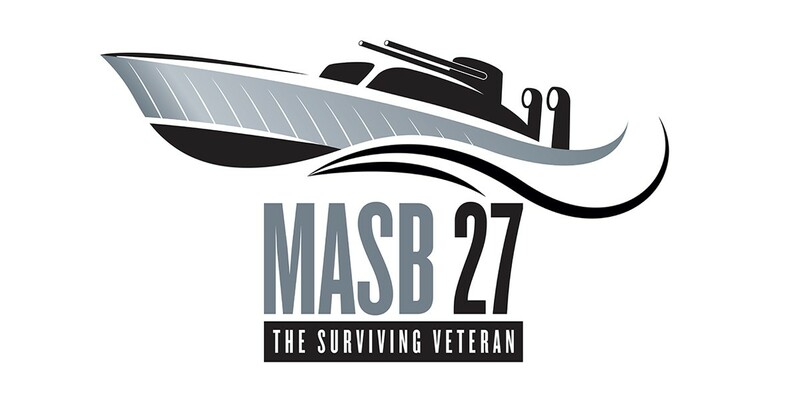 So during the planning stages for the 73rd anniversary we were feeling the pressure. How could we possible improve on HRH Prince Harry?! 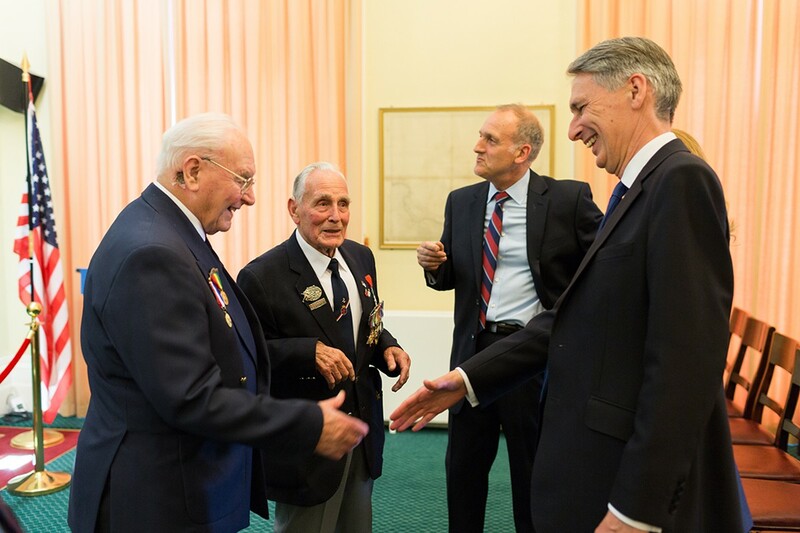 Through our management and distribution of LIBOR funding on behalf of HM Treasury we have plenty of opportunities to make the acquaintance of Normandy veterans around the country. Therefore we were excited to meet new veterans who were joining the group, bringing with them requests for attending ceremonies at places dear to them. As always, guided by the two Normandy veterans in our small committee, we do our best to accommodate such requests. The 73rdAnniversary began on Friday 2ndJune 2017. 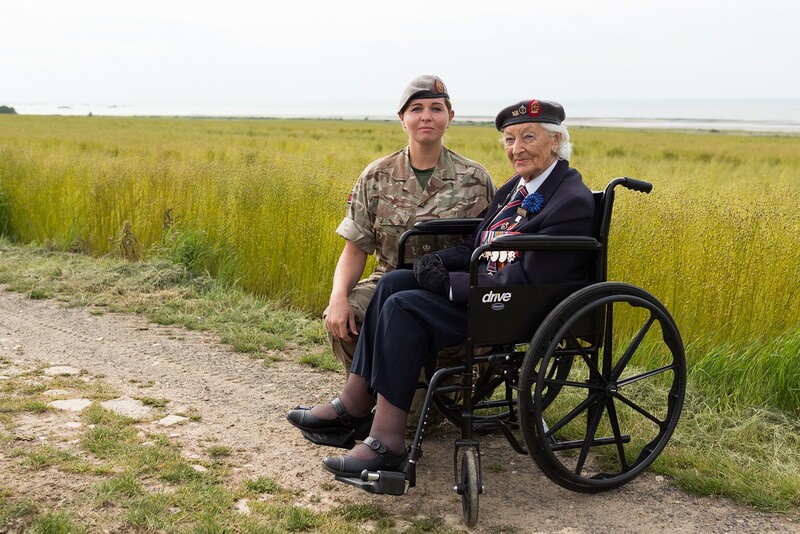 The final group consisted of 33 Normandy veterans accompanied by wives/companions and with 12 helpers, 2 pipers, 1 drummer, 3 serving RAF medics and 3 serving members of the Queen Alexandra Royal Army Nursing Corps led by Major Zoe Thompson. We were especially delighted to be joined by two American Normandy veterans: Ralph Avery of the US Navy and Robert Howard of the US Army. Both our “yanks” were returning to Normandy for the first time since they landed on D-Day. On Friday morning we made an early start in two coaches from Liverpool & Chester, collecting veterans in Knutsford, Stafford, Warwick and Oxford, arriving at the Queen’s Hotel, Southsea at around 4.00pm. Then followed a timely check-in and change so that we could be at Southwick House (Eisenhower’s SHAEF HQ) for our eve of departure ceremonial dinner. Upon arrival at Southwick Park, everyone was escorted into the main house to enjoy pre-dinner drinks… for some this was tea and coffee, others opted for a tipple of something stronger! We were pleased the Chancellor Rt. Hon. 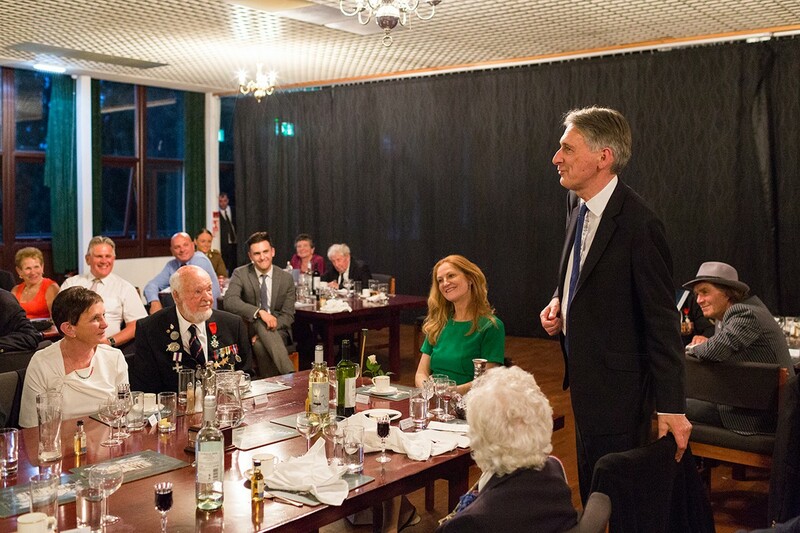 Philip Hammond and his wife had accepted our invitation to attend, providing D-Day Revisited and veterans an ideal opportunity to show appreciation for LIBOR funding of pilgrimage visits. Chairman of D-Day Revisited, John Phipps, welcomed Mr. & Mrs. Hammond who were accompanied by Captain & Mrs. Rex Cox. Other guests included Neil Rankin CB CBE, Peter Goodship of the Portsmouth Naval Base Property Trust (PNBPT) and the Hon. Jessica Berry. The Southwick House historian was pleased to offer everyone a historical explanation of the D-Day invasion story in the historic Map Room, before we were piped into the main Mess Hall for dinner. Our Chairman welcomed everyone and made a brief introduction of guests. This was followed by ‘Grace’ offered by Corporal Blakemore. A convivial evening was enjoyed by all, as usual a fitting start to the D-Day week. After thanks to the staff of Southwick House for their hospitality, John finished with a presentation of gifts which he handed to guests on behalf of the Normandy veterans. These consisted of various framed D-Day images, signed by veterans who were there on the day. Mr. Hammond responded with gracious recognition of the debt owed by the nation to our veterans and expressed the particular pleasure he took in seeing the banking LIBOR penalties used in such a fitting and constructive manner. In closing, he assured veterans that he would put their priceless signed gift in pride of place in his study. The whole dinner experience was delightful as always. Our gratitude goes to Mark Pennington and all the staff. 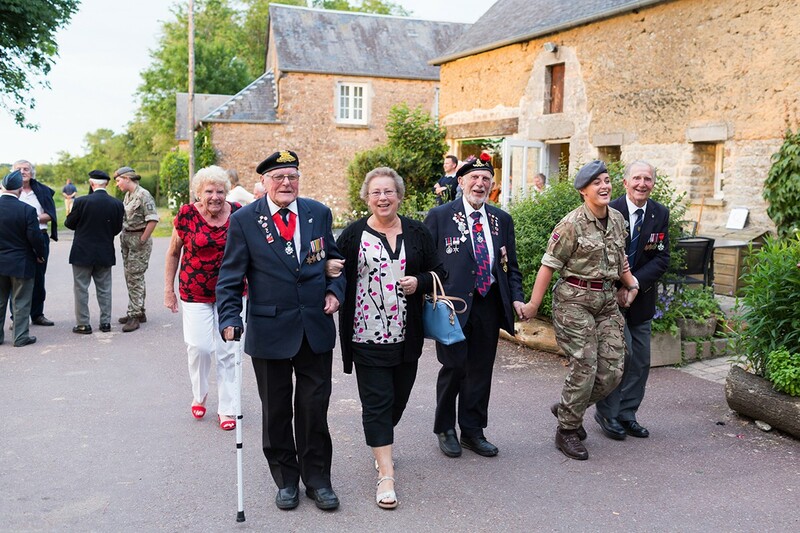 The Normandy veterans are always given very special treatment at Southwick House and it always seems that our expressed “thank you” is inadequate for the effort made by everyone. The following morning both coaches took the short journey from the hotel to the Portsmouth Historic Naval Base. Veterans were graciously invited to visit HMS Victory, the Mary Rose Exhibition and the other museums. Some opted for a harbour boat tour which took them around the military installations and moorings. We were then all treated to a delicious lunch at Boathouse No. 7, before boarding the coaches again to catch the Brittany Ferries afternoon service to Ouistreham. 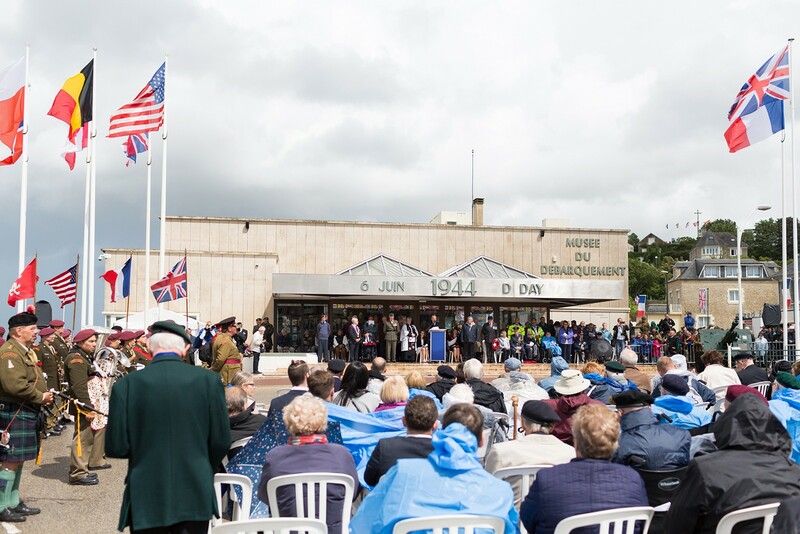 As is our established custom in D-Day Revisited, once in sight of Ouistreham Port and with the Captain’s permission, the veterans gathered on the rear deck for a ceremony of remembrance for all those lives lost on D-Day; killed at sea or on the shore line during the assault. As always, it was a fitting ceremony, watched by scores of the travelling public on board. Royal Navy veteran, John Dennett, gave the exhortation and US Navy veteran, Ralph Avery, was proud to lay the wreath. 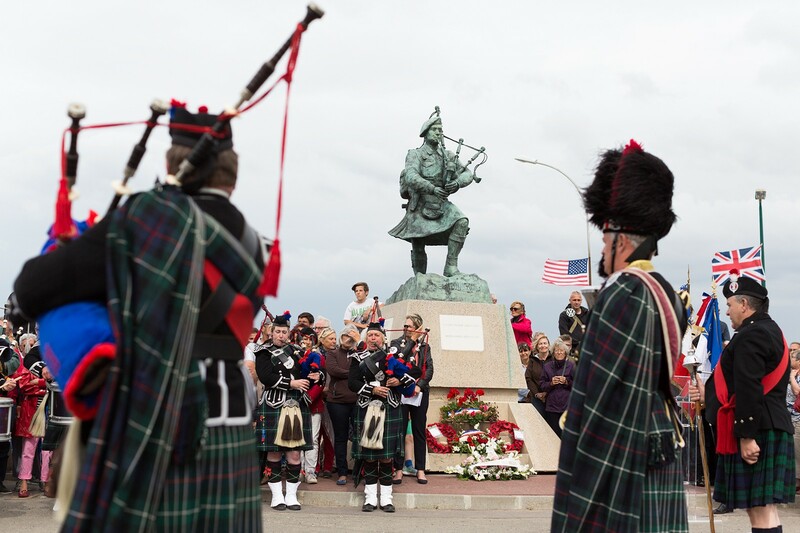 The pipers played a lament as we approached the French coast and Sword Beach. After a short drive to the hotel in Caen and a swift check-in well prepared by the hotel staff, everyone retired for the night. 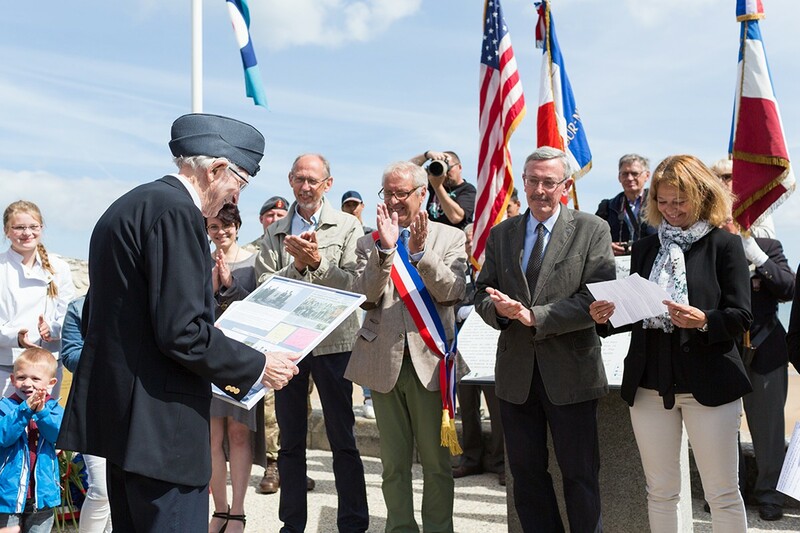 Our first day took us over to Vierville-sur-Mer in the American Sector where RAF veteran, Leslie Dobinson – a ‘new boy’ to our group – had arranged a wreath laying ceremony at the 2nd Tactical Air Force Memorial. Once all our veterans were in place, and cheerful introductions had been made, formal proceedings commenced, led by Mayor Monsieur Antoine de Bellaigue. As is so often the case in such circumstances, all arrangements had been thoughtfully put together by the local French people. As welcome visitors to this scene, one could readily see the enthusiasm for conducting this ceremony with due and proper respect and acclaim. Les Dobinson was given pride of place and brought forward to deliver his speech to all veterans seated in the front rows and the wider audience. Afterwards all veterans were treated to a Vin d’Honneur in the nearby community hall where we also enjoyed a packed lunch. Before boarding the coaches our American veterans took the opportunity to walk down to Omaha Beach. One can only imagine their thoughts as they walked on that sand where they had landed 73 years and 2 days before. The next stop was the US military cemetery at Colleville-sur-Mer where over 6000 souls are buried. As Robert Howard was helped through the Visitor Centre, he stopped at the big screen where 1944 news reels were showing. He sat very still watching the changing scenes and it was clear to see that he was cast back to a younger version of himself; seeing once again those battle scenes on Omaha. Robert looked into the middle distance and his eyes welled up. After the ceremony, we took our new American friends to the grave of Cpl. Lawrence Bekelesky and explained the story of our Millin-Montgomery Voyage in 2014. Visiting such a massive cemetery, it is easy to be over-faced with the size and impact of the scene. Without a set protocol, it is difficult to know how to react and what to do. We have found making this connection with one single grave certainly gives a sense of perspective. To have some knowledge of the story of one GI; one young man who had travelled thousands of miles to fight for freedom, yet found his final resting place overlooking Omaha Beach. After leaving Omaha, we visited the German cemetery at La Cambe. 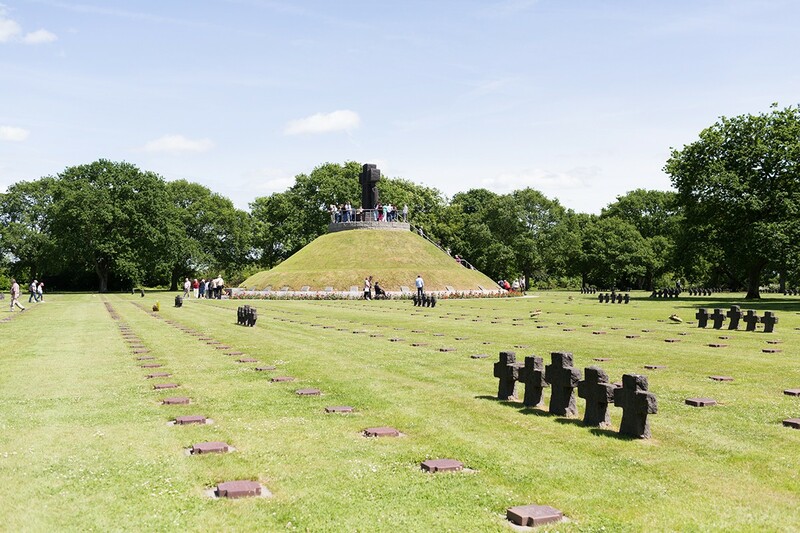 This was the first time D-Day Revisited had visited a German cemetery and it was an interesting experience. We appreciated it was a sensitive location to visit and understood entirely that many veterans preferred to stay on the coach. Others went to spend a few minutes looking around and we realised that whether they chose to visit or not really depended on what sort of encounters they had had with German forces. Some veterans viewed them as soldiers just like them, others simply cannot forgive their actions and both attitudes are entirely understandable. Next was Sainte-Mère-Eglise and the C47 Museum. Veterans formed up into a column of twos and were piped into the museum grounds. This scene drew quite a crowd of cheering and clapping onlookers. An arrangement had been made for Royal Navy veteran, Charlie Barnes, to be presented with his Legion d’Honneur. All gathered in one of the media rooms for the award ceremony which was formally conducted by a French General. Our thanks go to the Normandy Institute for their kind assistance in these arrangements. Upon leaving the museum, it was time to scatter and enjoy a wander around this small town. Sainte-Mère-Église is a magnet for WW2 enthusiasts over the D-Day anniversary week and so the veterans inevitably receive a lot of attention and all enjoyed watching the busy scene! We ended the day at the Auberge de L’Ouve. This was a delightful riverside farmhouse restaurant which had been recommended by Simon Rock de Bessombes of the nearby Normandy Institute. The rustic tables were all beautifully laid out for our party of 100 – quite a large quantity for any restaurant! In such a peaceful and traditional French setting, food and drink were served to everyone’s pleasure, making for a very happy and convivial evening. This was a time of enjoyment and veterans reminisced about Normandy, but also about more recent times. A poignant new friendship was formed between RAF veteran Frank Ferguson and the young RAF medic, Jacob. With nearly 70 years of age between them, as they enjoyed their meal, Frank enjoyed showing Jacob his original RAF log books and of course Jacob was thrilled to see such fascinating records of Frank’s flying experience in Normandy. It had been a long day and there was the drive home to the hotel. With everyone settled comfortably in their seats, Victoria put some themed 1940s music and all were offered a tot of the hard stuff! During the evening meal at Auberge de l’Ouve, we spoke with South Staffordshire veteran, Bob Laverty, and Royal Norfolk veteran, Ron Minton, about a battle they were involved in over a Château just north of Caen. They both arrived in Normandy some days after D-Day and coincidentally, despite belonging to different regiments, were assigned this same first task. They both recalled approaching a Château with fixed bayonets through tall fields of corn. The more the story unfolded, the more memories were triggered and they recalled how frightened they had been… “We were just boys. We were green!” Ron recalled the name of a nearby town; Epron. So we decided to do some digging and see whether we could track this place down! After a bit of online research and a wander around google maps we found Château de la Londe and decided to take a slight detour on our way to Pegasus Bridge the following morning and do a drive by on the off-chance this was the place. As soon as Ron saw it he felt confident it was the Château he remembered, but Bob was not so sure. 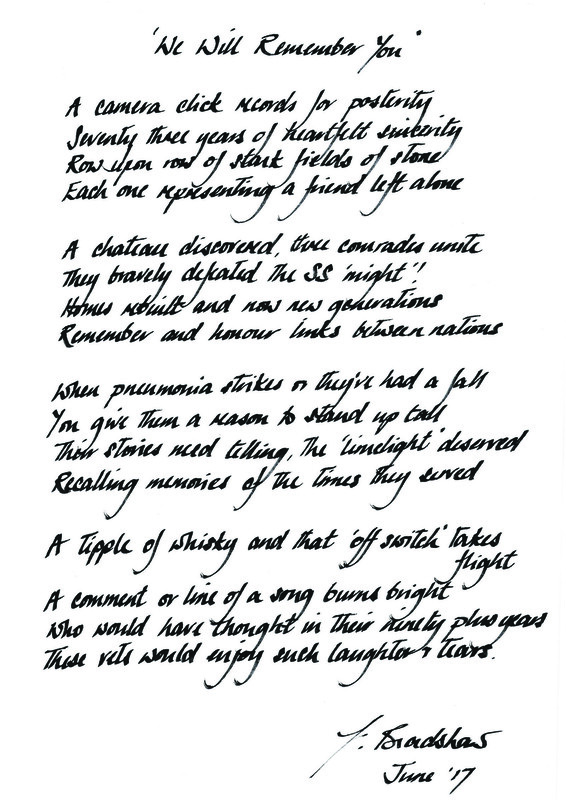 Then a third veteran, Gordon Drabble, saw the house and found it familiar as well. So we let ‘Red Bus’ go on to Pegasus Bridge whilst Frédéric Mathieu and John Phipps walked up the long private driveway we knocked on the door! We were so thrilled when the chatelaine confirmed there had been a battle for the site, which was strongly defended by SS Panzer-Grenadier Regiment 25. To our complete surprise they invited us all to come and have a look around the garden to see if the three veterans recognised anything more. Three generations of the family came out to greet us with photographs from before, during and after the war to show us all. It was clear the house had been very badly damaged during the fighting and repairs had only finally been completed 5 years ago. They took us on a tour of the garden, when Bob instantly recognised the “start line” – the wall at the end of the garden where they had commenced their attack. It was so humbling for those of us who were there to watch these memories unfold as these visual triggers emerged one by one. We’d like to thank Mme. Alix Casal and her family very much for their warm welcome and being so kind as to share their photographs with us. It was an experience none of us will forget. After a fond farewell ‘White Bus’ moved on to Pegasus Bridge, where veterans and companions visited the museum and joined in the commemorations. 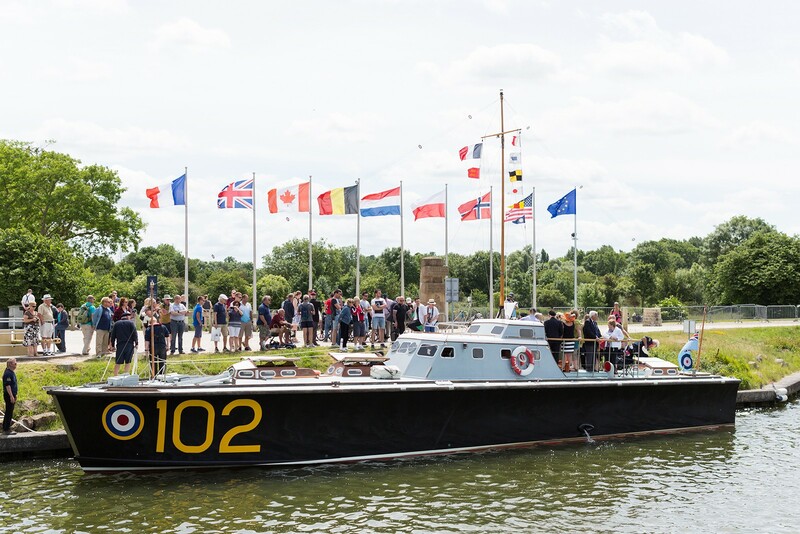 Others opted for a run up the Orne River on HSL-102 which had been brought over from Portsmouth by the PNBPT crew. Madame Arlette Gondré had invited our party to have lunch in the grounds of the Café Gondrée. The first house in France to be liberated and the café has become a symbolic shrine to veterans of the Parachute Regiment, so it was the most fitting venue for our packed lunch. Afterwards we moved on to Ranville Cemetery where we held a wreath laying ceremony. Although each event and ceremony has its own importance, such a large group of veterans inevitably attracts attention. 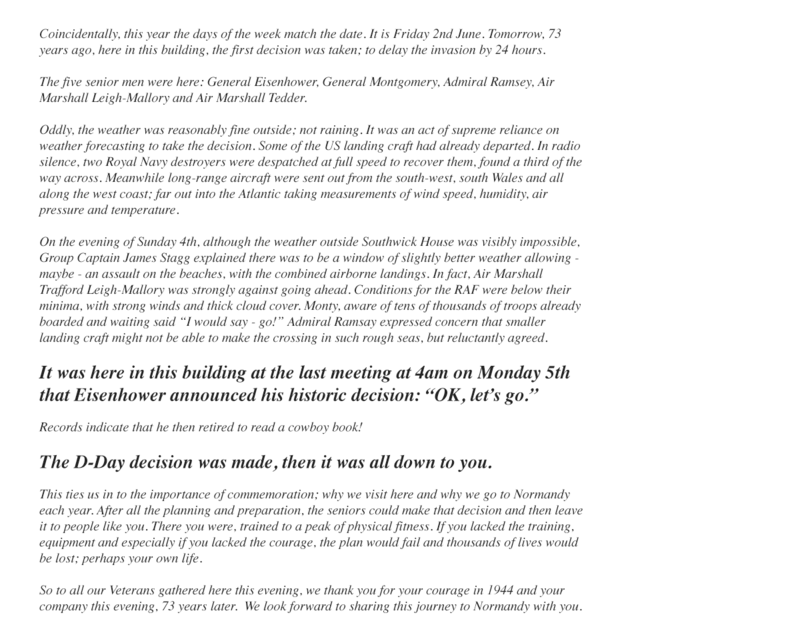 For the residents of Colleville-Montgomery, anniversary ceremonies of the D-Day landings are very important. Represented by Mayor Frédéric Loinard, every year the people turn out in large numbers at the Montgomery and Piper Millin statues and at Hermanville Cemetery. This year we attended the Millin Statue parade and wreath laying. This is always very respectfully executed, with heartfelt speeches by the Mayor and other community representatives. Unfortunately and unusually, John Millin was unable to attend due to illness but the British contingent was well represented by Tosh MacDonald and the Jedburgh Pipe Band. Every year it is noticeable that efforts are made by the local townsfolk to provide seating and refreshments; all fittingly on the edge of Sword Beach. Although we could not keep up with the program, this being due to mobility restrictions. Every movement must allow ample time for veterans and their wives/companions to comfortably de-bus and re-bus. By the time we reached the Hermanville Cemetery, much of the Mayor’s ceremony had been conducted. However, there was a very considerable gathering and all were delighted to see such a large gathering of British veterans. One of our veterans, Oliver Coulthard, made a particularly moving tribute to his school-friend, Dougie White, who is buried at Hermanville. Having located the gravestone, Oliver related the story of their friendship. When Oliver had finished, Piper Craig Wright played a lament as the wreath was laid. These personal tributes are deeply moving for all involved and of course so meaningful to the veterans, making the whole trip worthwhile. A little behind schedule, we travelled the short distance from Hermanville to the restaurant at L’Ecume des Mers, which faces Sword Beach. Our first time here, the venue was ideal and we were warmly welcomed by the patron and staff. As veterans climbed down from the coaches they were pleased to be piped into the restaurant by the Jedburgh Pipe Band, who then all joined with us for our evening dinner. We were pleased to see our dear friend M. Paul Chandelier, Mayor of Thury Harcourt, and his wife Catherine there to greet us too. We all took our seats for a very convivial and festive meal. After the meal, the band toured the restaurant playing their hearts out with drums and pipes… not your regular restaurant visit! The best endorsement we had to the evening was from Royal Navy veteran, Bill Harrison, who collared John Phipps and the patron cheerfully challenging: “I will give you £1000 here and now if you will book this for next year!” We can feel sure that Bill enjoyed his evening! After the pipers had blown their last tune and glasses were emptied, all boarded the two coaches for the short journey back to the hotel. It had been a long day, but a grand one. Once again the traditional schedule was followed for the morning of D-Day. Although many veterans and their companions enjoy the Cathedral service, there are some who prefer an alternative, so this year we separated coaches: one to Bayeux Cathedral and the other to a small and peaceful cemetery near the village of Secqueville. We reassembled at the Bayeux Cemetery, where the traditional parade ceremony took place as organised by the Royal British Legion. It was a well attended event in bright & dry weather. One of the veterans in our group, Ray Lord, had been selected to speak, after which wreathes were laid at the memorial. On completion, all our veterans and their companions returned to the coaches for a packed lunch and then onwards to Arromanches. Upon arrival, all assembled at the L.S.T. & Landing Craft Association memorial alongside the artillery piece overlooking Gold Beach. The wreath laying ceremony attracted quite a crowd of onlookers. 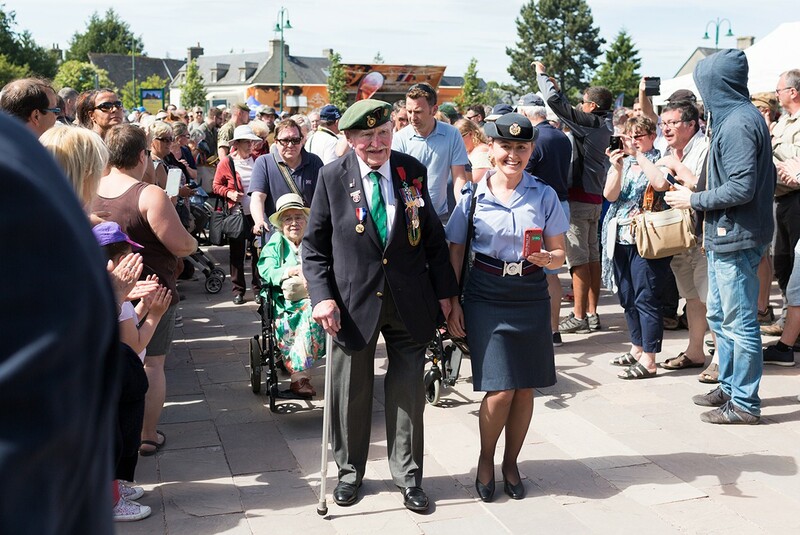 Once completed, the veterans were encouraged to spend an afternoon of free time enjoying the cafés, bars and shops along the sea front. For many years we’d had to leave Arromanches by 5pm in order to allow ample time to return to the hotel for dinner. It seemed a shame to drag everybody away when they were having such a splendid time enjoying the atmosphere and it also meant we missed the main parade. To deal with this the Town Council, represented by Adrian Cox, brought the time of the main parade forward to 4pm, keeping veterans together for longer and making for a grander event. This year they also arranged for us to have a dinner, with themed entertainment, in the Salle des Fêtes situated in the very heart of the town. 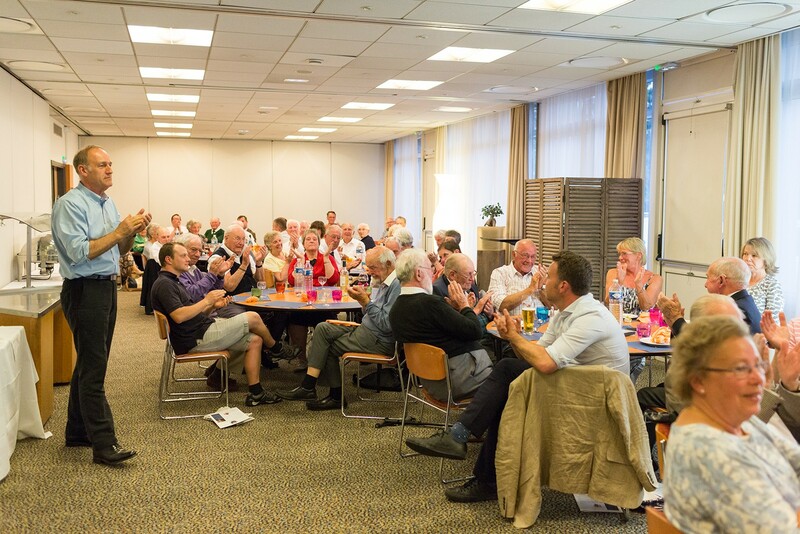 Having enjoyed a relaxed afternoon, veterans were pleased to settle down for a fun evening meal. The coaches returned to the Caen hotel by mid-evening. Some promptly retired for the night, whilst others enjoyed a comfortable winding down period at the hotel bar. After the previous long and busy day, D-Day +1 was more relaxed. 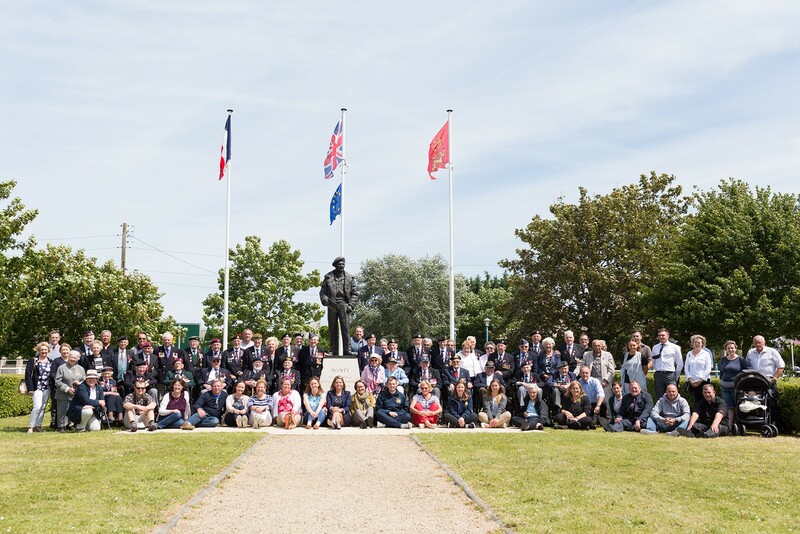 We arrived at the town of Thury-Harcourt at 10am and were greeted by the familiar sight of the Mayor, Paul Chandelier, and a large gathering of French military veterans and townspeople assembled at the memorial to the 59th South Staffordshire Division. 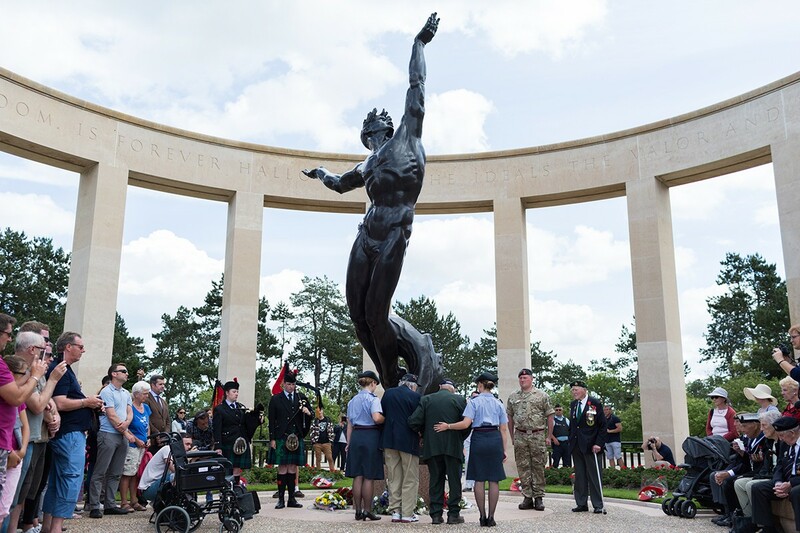 After a happy reunion with our friends, veterans conducted a wreath laying ceremony and the local schoolchildren sang God Save the Queen, followed by the Marseillaise. Everyone then reassembled outside the town’s church, where a ceremony was conducted in memory of civilians of Thury-Harcourt who lost their lives during the liberation. The children once again took an active part and took the time to walk amongst the veterans afterwards – shaking hands and giggling! Our complete party was then invited to an enormous lunch in the Mairie, where proceedings began with an exchange of speeches by Mayor Chandelier, followed by John Phipps on behalf of the veterans. Responding to this generous welcome and hospitality, John dwelt on the theme of the civilian experience of violent liberation. Having not been occupied by an enemy power in recent history, the desperate and life-changing traumas are of course beyond our understanding in the UK. In recognition of civilian casualties, it is especially difficult and troubling for veterans to understand the friendly welcome they always receive in this small Norman town. However seeing the lively community and the children growing up in freedom, it is possible to make some sense of the lives lost. A special guest on this occasion was M. Michel Marie, who is the subject of a celebrated wartime photograph. Michel clearly represents all the french civilians, especially the children, whose lives were thrown into chaos by D-Day. Michel presented us with a signed photograph of himself at the age of 6, standing amongst the rubble in the nearby town of Villers-Bocage. After bidding our friends farewell “…until next year!” we headed back towards the coast, taking a tour of the bocage en route. We paused at Fontenay-le-Pesnel to lay a wreath at the cemetery there. 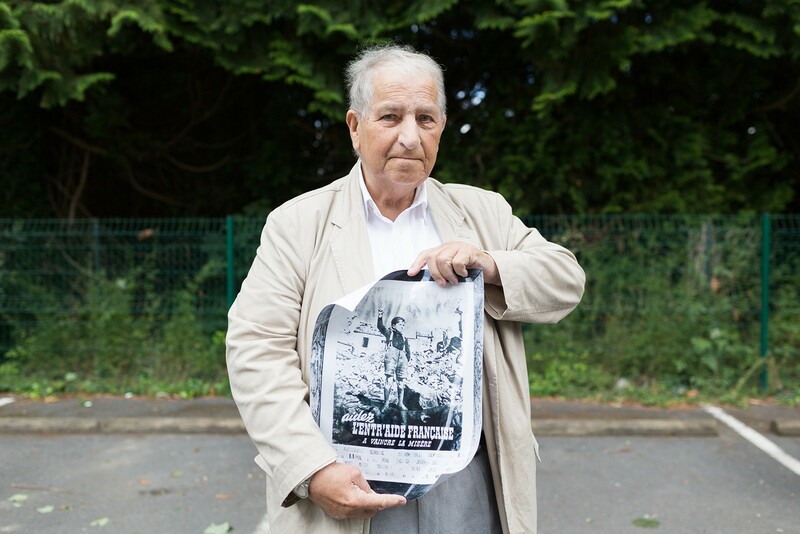 During the onward journey, Royal Artillery veteran, Joe Cattini, came to the front of ‘White Bus’ and spoke to all the passengers over the microphone; relating the story of his advance from Gold Beach through the bocage region until he reached Falaise where the decisive battle of Normandy took place. Everyone was most interested to hear about a fellow comrade’s experience, which is why we always encourage veterans to share their stories if they are comfortable to do so. Arriving at Ver-sur-Mer, one coach stopped for a short visit at the town’s small museum as the other continued to the site where the new British Memorial is to be built. An arrangement had been agreed to meet Trustee, Nicholas Witchell, and the Memorial architect, Liam O’Connor. Along with Mr. Witchell, there were several local dignitaries and representatives, including the Mayor of Ver-sur-Mer. All were keen to show the benefits of the chosen position for this new British Memorial. Indeed the wide vista from the Gold Beach site is quite remarkable, from the American landing beaches and the remains of Mulberry B Harbour to the west, to Juno and Sword beaches in the east. Happily it was a dry and bright day with clear visibility. 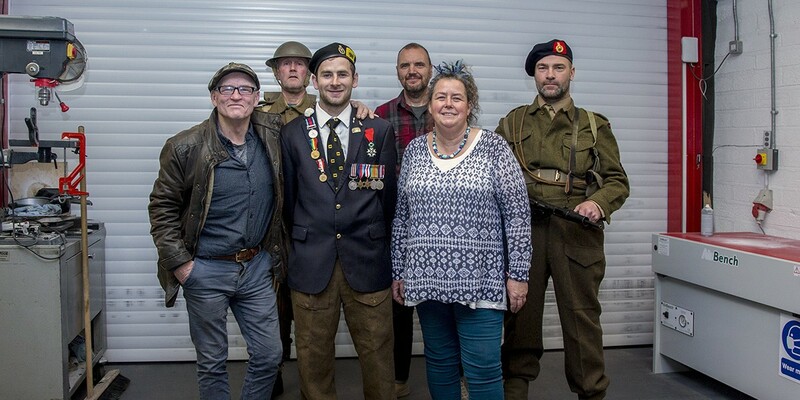 The veterans seemed very happy with the location and were quick with questions of every kind. Delighted to see such a large group of veterans, local people were keen to hear their opinions. Of course the site was agricultural, with just a rough unmade track for access. 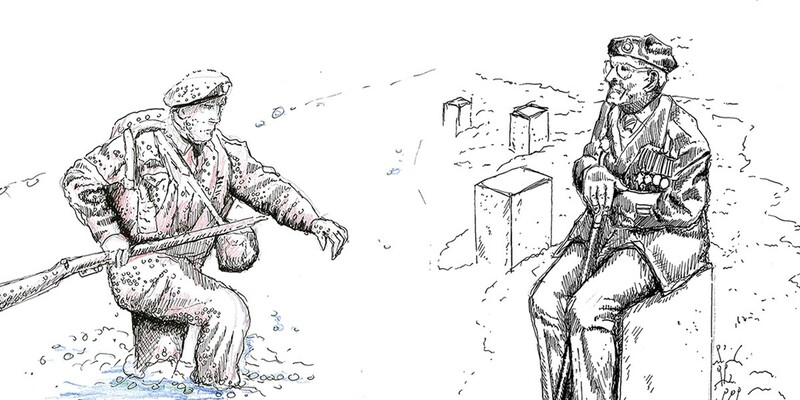 Liam O’Connor explained his plans in broad terms with impressive rendered images depicting the final scene. There was a film crew in attendance, conducting brief interviews with some of the veterans and recording their opinions. Particular attention was given to Queen Alexandra Imperial Military Nursing Service (QUAIMNS) veteran, Vera Hay. Vera gave her very first interview to camera that day on the site above Gold Beach where she landed just before D-Day. As the veterans returned to the coaches in preparation to leave. Mr. Witchell thanked them for their visit and promised to keep them posted on progress through the Normandy Memorial Trust newsletters. Arriving back in Caen, there was a short time for freshening up before the last evening dinner. This is traditionally held at the hotel as an ‘end of term’ celebration. After desert had been served John delivered a speech which reflected on the week, but largely themed as a thank you to the volunteers who had given up their time to help, including the 6 QARANC medics. Clearly, the pilgrimage trip to Portsmouth and Normandy would not be possible without this professional and caring support. A special thanks was offered to Frédéric Matthieu and Dr. Dan Bartram. What a team they made together when dealing with any medical concerns! Both had volunteered to miss the visit to Thury-Harcourt so they could accompany veteran Cyril Elliott to the Caen Hospital and worked out shifts to stay with him until he was discharged. Our two pipers, Craig & Robyn, were thanked, along with other valued volunteers: Eamonn Cowan, David Phipps, Edwina Phipps, Phil Bygrave, Beryl Dibble and Lee Mottrom. John also thanked the Carvers coach drivers who, as always, had behaved above and beyond the call of duty. In response, Major Zoe Thompson gave a speech on behalf of the QARANC team. Although accepting our thanks, Zoe expressed her own appreciation for having been invited to be involved in such a wonderful experience: “…one which they would always remember fondly“. To everyone’s surprise, Dorothy Avery stood up to say a few words of thanks to the British veterans for making her and her husband, US Navy veteran Ralph, feel so welcome. She recalled how Ralph used to tell stories of his time in Normandy after the war and would always say the Brits were “...an OK bunch!“. This triggered an outburst of laughter! 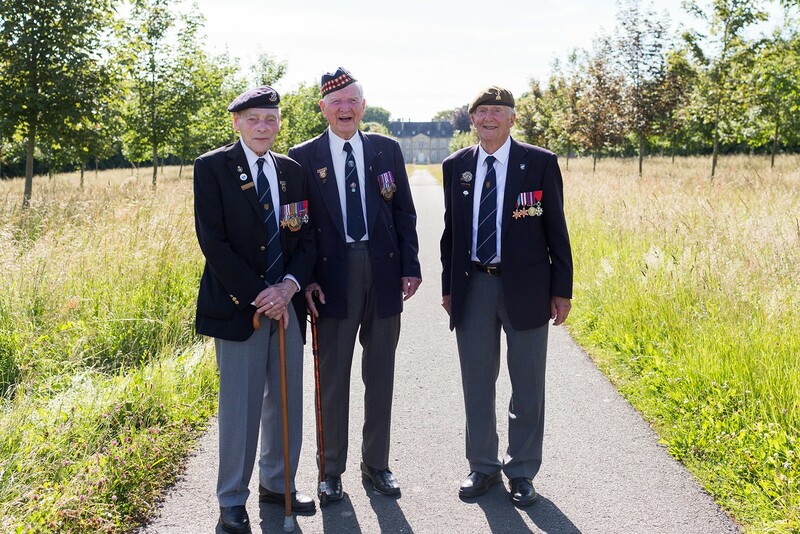 It had obviously been a very emotional week for Ralph and his pal Bob, neither of whom had returned to France since 1944, so it was lovely to hear how much they had enjoyed the experience in the company of old allies. After a hearty breakfast, we checked out of the hotel the following morning. With all aboard (including Cyril, who felt much better!) we set off for Ouistreham where we conducted a wreath laying ceremony at the Royal Navy & Royal Marines Memorial. It was thought that we always seem to squeeze this short ceremony in whilst awaiting the ferry, so it seemed more respectful to make proper time to visit this memorial. We followed this ceremony with a trip to the Musée No. 4 Commando, which we hadn’t visited before. Displays include a short film of the training conducted at Achnacarry, known to a generation of trainee commandos as “Castle Commando”. Commando veteran Patrick Churchill particularly enjoyed the visit, which brought back lots of memories for him. We hadn’t yet visited Monty in Colleville-Montgomery. It was a beautiful sunny day, so on our way to lunch we stopped there to take a few photographs. “Class of 2017”: veterans, wives, carers, organisers, medics, helpers, pipers, drummers, drivers and hangers-on! Lunchtime saw a visit to the nearby supermarket where everyone spent a couple of hours enjoying their own choice of lunch, along with a bit of French souvenir shopping! By 2.30pm the coaches were checking in at the Brittany Ferries Ouistreham terminal. Once on board, all settled in comfortably to a smooth crossing back to Blighty. Arrival into Portsmouth was at about 9.30pm, when we returned to the Queen’s Hotel in Southsea. After one more hearty breakfast and with check-out completed, it was time to say our goodbyes and begin the journey home.